Search is still in high demand. As the market picks up Sydney is again becoming candidate poor with search candidates securing new employment. Big brand search agencies are again calling for quality search engine marketing and optimisation staff. Here are three new SEO and SEM jobs that need to be filled this side of the New Year. This is a strategic marketing role, where you will help you clients build a search strategy to sell their products and services. You will not be hands on with the operations side of search but will work closely with the search experts to help your clients achieve their results. This is a big brand search company and you will be working with top tier clients. Ideally you will have agency experience working in the digital space with big brand clients. In this role you will be looking after Tier 1 clients. You will help them build their search strategy and grow their business. In this role you will look after all aspects of onsite optimisation and work with a team of specialists to build links and write content for your clients. This is a new position bases in North Sydney. There is a great team to work with and you will get the chance to strategise with major clients. This is an excellent opportunity to join a great search team. You will be looking after big clients and you will be hands on with the campaigns. This is a really social location based in the heart of the Sydney CBD. If you love SEM then this is the role for you. 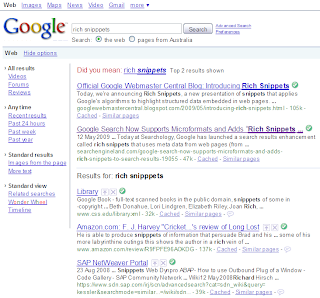 On September 30th, Google announced the introduction of a new converison metric in Google Adwords. The new metric is called View Through Conversion and aims at offering more visibility on the performance of banner ads in the Google Content Network. Ads in the Google content network usually do not perform as well as ads in the search network (some exceptions might exist) or more exactly, they do not perform in the same way. 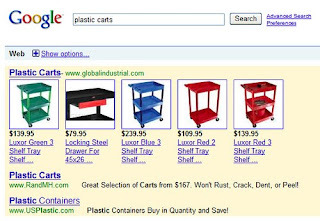 Ads in the search network targets users searching for products or information. In this scenario, the user is the instigator; he "asks" for some sort of information and expect "answers". If your ad is relevant to the user query, he is more than likely to click on it and if your product or information matches what he is looking for, he is more than likely to purchase or convert. Ads in the content network or more generally display ads are a bit different. In this case the user is "browsing" and not actively looking for specific information. The banner ads or text ads are here to entice him to click. As the user intent is not the same , the click-through and direct conversions are usually lower than in the search network. However, banner ads offer more opportunities for brand exposure (branding) than search. You will be able to display your brand in a better way (image/flash) and in locations where you are more than likely to reach your target audience. Even if it does not translate into a direct conversion, branding (banner being displayed) can result in a user searching for your brand in Google or even go to your website later on and buy your product. These indirect conversions will not be recorded under display ads or content network in your analytics report even if branding has probably contributed. The View Through Conversion metric actually fills this gap and allows you to measure the number of conversions, which resulted from a banner being displayed. 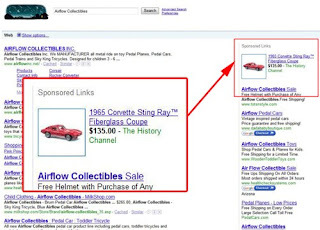 The main purpose of the metric is to measure the "indirect' impact of banner ads. If someone has viewed one of your banners and not clicked, but has converted in a 30 day period (whatever medium is used for the conversion), your banner will be attributed a view through converison. You can then measure the impact of each banner and optimise them accordingly. While not perfect (the results still need to be interpreted with caution), this metric offers a good way to measure your ROI and justify your banner display spending. Over the last two years, Omniture has demonstrated a very agressive external growth strategy, with the acquisition of 5 web analytics companies (Visual Sciences, TouchClarity, Instadia, Offermatic, Mercado). All these acquisitions re-inforced Omniture's market shares in the web analytics market and contributed to expand the Omniture Suite of products. Omniture has also invested on business development all over the world in order to build a strong portfolio of Fortune 500 companies. Strategically, this partnership makes quite a lot of sense for Adobe and hopefully will help creating more bridges between the Flash technology and e-commerce as well as improve the way Flash can be measured and tracked. The market is picking up again and I currently have four excellent search roles. Who here has used Google's Conversion Optimisation? Well then get in touch, my client has just won a ton of work and looking to bring someone on to carry it out and then build a team below them as they continue to grow this offering. Massive opportunity!!! Enjoy being hands on? Work with large clients to implement SEO strategies for them on an onhoing basis!!! More info only a phone call away. A recent MarketingSherpa survey has shown that 48% of marketers are planning on increasing their social media budgets in the next year. 2010 is the year for social media networks. The buzz comes from everywhere, marketers, advertisers and agencies want to have their share of the social media networks and make money out of it. Before doing so, it is mandatory to understand social networks hence a quick post about Facebook's statistics. In December 2007, we dedicated a post on the social media trends in Australia, which showed the rise of Facebook as a major contenter. In the world the Australian Facebook population ranks #8. 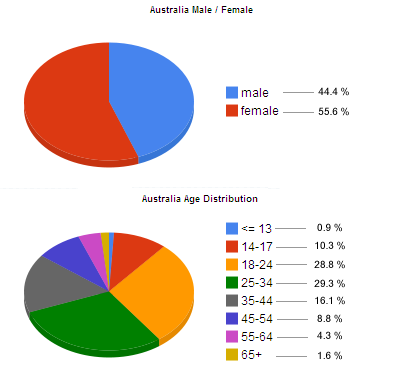 In terms of demographics, the Australian Facebook population is made of 55.6% of female and 44% of Male. In terms age, Facebook remains a generation Y social network. The biggest segment is the 25-34 years old with 29.3% followed by the 18-24 with 28.8%. The 35 years + segment currently accounts for 30.4% of the Australian Facebook population and is according to Nielsen Online, the fastest growing segment. Due to an increasing demand for more virtual social interactions and the strong desire to build a stronger SEO community in Sydney and more widely in Australia, we have created the SEO Sydney Blog social network on Ning. The SEO Sydney Blog social network uses the Ning platform, which offers some interesting features including member profiles, member-to-member communication, forums, events and more. The idea is to improve interactions between our readers and our content as well as between members. Using the SEO Sydney Blog social network, you will be able to share useful information on SEO, the latest events and even start discussions on SEO related topics. You will also be able to connect and communicate with other Australian SEO Professionals, which should be good for networking. At the moment, there is not much content on the SEO Sydney Blog social network, but we hope you will join and share your opinions. If you want to join it is 100% free. As a freelancer, the most exciting, and sometimes stressful part of your time is to secure your next job. While networking and word-of-mouth referral is still the best bet for long-term contracts, it is also quite handy to be able to expand your network and apply for additional jobs when your are not as busy. Over the years I have joined a couple of freelance networks, which have helped meeting both ends. However do not be too excited as the competition is often quite intense. On most jobs, you are competing with people in Asia or India, who only charges a few dollars per hours, so it can be hard to get a job. Also some of these "freelancer's platform" often require to pass a test and/or install a particular software on your computer. Well people, it seems that you are in high demand. I have a few roles I need to fill asap. These roles are all based in Sydney and are looking to hire immediately. SEO – SENIOR SEARCH ANALYST – This is a hands on SEO role, 5 years plus search is required and a healthy pay packet to boot. SEM – CAMPAIGN MANAGER – This is a hands on SEM role, involving multiple campaigns, small and large budgets. There is some client facing work involved but mostly managing campaigns. SEO – SEM – SALES MANAGER – This is a hands on sales role, selling search solutions for one of the big search brands. A top role with great opportunities to earn big bucks. SEO TRAFFIC SPECIALIST – This is a client side role for one of the biggest brands in Australia. You will need to have 3 year plus experience and be hands on with search. A proven track record in driving traffic to sites. I hope all is well. It was good to see the results of the SEO Survey! What jumped out at me was that average salaries and experience have increased… however there seems to still be some individuals being paid less than their skills are worth. I currently have two live roles working for two completely different clients. One role is live with a well established search business and start date will be in the next four weeks while the other role is with a start-up which has an all star director line up from some of the major publishers. The first role will see you working with a large and one of the most switched-on teams of organic and paid search specialists being hands-on in end to end SEO projects; whether this role is contract or perm is still undecided but previously contractors have had the opportunity to go permanent at the end of their tenure as this company continues to win new business and tries to manage this demand. With both roles I’m looking for passionate search consultants. If these roles do not suit you but you are interested in being represented in the market now or in the future, feel free to get in touch as at Xpand we prefer to be proactive with client and candidate needs. The act of Google Bombing aims at raising the ranking of one page by creating a large amount of links with a specific anchor text (often for political reason). The practice is not new. Back in 2005, George Bush got bombed and ranked first for the phrase "Miserable Failure". 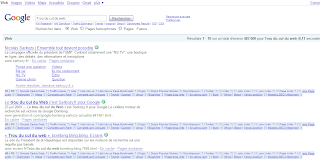 According to the French media, Sarkozy's Google Bombing is the result of a webmaster coalition, which created a relatively important number of links with the anchor text "trou du cul du web" pointing to the offical Sarokozy's website (www.sarkozy.fr). This time, Google has been quick to release comments explaining that the incident does not reflect the company opinion and is the result of an algorithm abuse. In January 2007 Google defused the embarrasing Bush bomb thanks to a change in their algorithms , which aimed at returning commentary, discussions and articles about Googlebombs rather than the "victim" website. Looking at Sarkozy's case, it seems like they still have a bit of work to do. Since April 2009 we have been running the second Australian and New Zealand SEO SEM Salary survey. We have finally collected enough responses, analysed the data and created a presentation to display the results. The document displayed below outlines the key findings of the survey and is available for download here. You will notice that the analysis is quite basic, but we are planning on releasing a more advanced report (including correlations) in a couple of weeks. Hi all, hope you are looking for a new challenge because we have some Sydney and Melbourne based roles to get your teeth stuck into. For more details please give Shai or I a call. All contact details are below. If you are a search engine marketing specialist I don’t need to explain it, just hit me up and lets see about a new role. The inaugural Online Retailer Exhibition and Conference will take place in Sydney on the 18th and 19th of August 2009. The conference organised by Marc Harvey from National Media, is the only event in Australasia exclusively focused on internet retailing and e-commerce. According to their website, over 550 online and multi-channel retailers have already registered. The figures set some high expectations for a new event! One of the great thing about the online retailer conference is that you can get a Free Pass for the exposition, which allows access to exhibitors stands and keynote presentations. The program of the conference also looks pretty exciting with topics covering a large range of activities from web analytics, to user experience and shipping. Following Kevin Rudd's tax bonus, Google Australia has released its own "stimulus package" aimed at helping Australian small businesses driving more sales online. 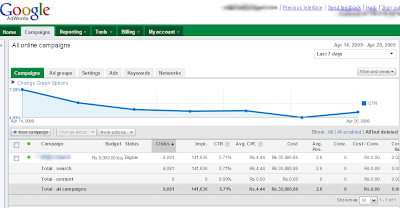 The offer consists in a free $75 credits on any new Google Adwords account created. If you are an existing advertiser, the offer does not apply but you are eligible to a Special Master Class seminar to improve the performance of your campaign. Even if Google's stimulus might be more targeted at increasing their customer base and generating good PR than a genuine act of charity toward Australian businesses ( read ITNews), it is still an interesting offer that many businesses will appreciate. This organisation is renowned as market leaders in the Search industry and are looking for people who are as passionate about SEM & SEO as they are, and who enjoy working with a team of people who understand that work should be fun! We're looking for a driven Business Development Manager with a strong interest in digital media, online marketing & SEM & SEO. You will be the Search guru for your target clients - presenting them with exciting and innovative ideas for online campaigns. Work as part of a collaborative team and have fun! Demonstrated commitment to quality of client service. To apply for this opportunity please contact Brioney @ Xpand on (02) 9346 5205 or click here to send an email. Last year, SEO Sydney Blog conducted a survey on the SEO SEM Salary in Australia and New Zealand. The survey was relatively successful and the results have generated a lot of positive feedback from SEO SEM professionals, recruitment agencies and recruiters. In 2008 the Australian and New Zealand search industry has grown at a double digit rate. Agencies have expanded, more companies have integrated search in their marketing or IT departments and all this had an impact on the SEO SEM job market and salary. To measure the differences between 2008 and 2009 we have decided to re-conduct the SEO SEM salary survey. The survey is open to SEO and SEM professionals working in Australia and New Zealand and will run for 2 months. The survey is short (10 questions) and will only take you 5 mins to complete. 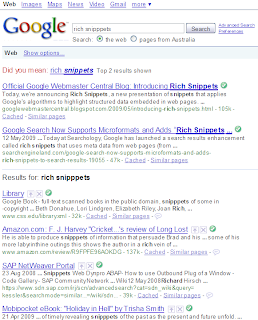 At the beginning of June, we will release and publish the results on SEO Sydney Blog. It has been 3 months since the latest Google PageRank update announced by Matt Cutts on December 31st. By the look of it, Google is running its latest update of the green bar. Today, I have noticed some of my clients'PageRank going up, which is a great news. No PageRank drop so far. At the moment SEO Sydney Blog is stable at 3 but things could change over the next couple of days. One interesting thing I have noticed over the last year, the updates are taking place at regular intervals (every 3 months). Couple of years before, the updates were a bit more unpredictable. Based on the last year updates, it is highly likely that the next one will occur on July 1st 2009! The world of Search Engine Optimisation is constantly evolving, but a person with your passion for SEO has no trouble keeping your finger on the pulse. In fact, it’s the new technologies and challenges that get you to your computer every morning. As an SEO and production professional you are not only well-versed in the most successful optimisation techniques, but you can also tell the difference between best practice methodologies and dubious fads. In partnership with our SEO Specialist and external vendor you will work towards delivering and implementing tangible SEO results for our four retail websites, with a focus on content, site architecture and social media. Your experience in digital content and production will equip you for working with our busy, innovative team. With your self assured approach, you will shine under pressure, meeting challenges head on in order to thrust our business into the spotlight. This is your chance to make your mark with a high-profile project for a major brand. Don’t miss it. Interested? Call Richard Pickford on (02) 9292 8708 for more information. Or if you're already convinced, visit www.iagcareers.com.au/seoblog to apply. This time of the year is packed with great conferences. Next week is SMX Sydney (Search Marketing Expo) taking place at Luna Park on the 2 and 3rd April. I do not have tickets for this year conference, but I went to last year's edition and to be honest it was great. SMX Sydney is probably the only event in Australia, which bring renowned international speakers. This year's edition gathers Rand Fishkin from SEOMoz, Bruce Clay from Bruce Clay and some other "famous" industry experts. The 2009 Agenda looks interesting as well. Even if topics are quite balanced, it seems that this year edition is more focused on SEO. It is also great to see that more and more advanced sessions are included in the program. For example the first day has sessions focusing on specific topics such as 301. In terms of cost it is a bit steep, but it is a quality event. The 2-day pass costs $1595,00 and a 1-day pass costs $595.00. I know it is short notice, but I think you can still register here. The G.F.C (Global Financial Crisis) seems to settle and expand on the Australian soil. After poor months in December and January, the IT/Technology job market has reached it's lowest level since 2000. According to the Australian IT the technology job sector has slumped by 16.78%. This trend is mostly due to the lack of investment in new projects and the outsourcing of IT departments. The Internet/Graphics/Multimedia has seen a drop of 3.8%, which is not too bad considering the current situation. Judging by the amount of work I have and the number of jobs in the main employment websites, I would say that the SEO/SEM/Online Marketing sector is less impacted than the rest of the internet sector. If you have been in a cave for the last 8 months and just got out (you probably should have stayed), you have noticed that the global economy is in recession. It is a reality; the acronyms GFC or GEC are more popular than PPC and social medias are invaded with articles on how to survive the recession. - Google (Search Engine - Advertising Network): Officialy .100 recruiters, + 10,000 contractors. - Yahoo (Search Engine - Advertising Network): 10% of the workforce (1,520 jobs). - TicketMaster(Shopping): 35% of the workforce (around 1000 jobs. While affected, it seems that Australia is not doing too bad. In many cases, Australian employees have not been laid off, which is a positive sign.